CALL-IN DAY: Give Wendy’s Board Chairman Nelson Peltz a ring on Jan. 27! Join the Fair Food Nation on Jan. 27 for a call-in day to the offices of Nelson Peltz, Wendy’s Board Chairman and major shareholder, to let him know time is up – and his company’s participation in the Fair Food Program is long overdue! In addition to being among Wendy’s top leadership, Peltz is the CEO of Trian Partners investment firm, the restaurant's largest shareholder. Combined, Trian and Peltz hold close to a quarter of Wendy's shares, exerting considerable power in the company’s decision-making. Peltz has rejected farmworkers’ and student demands to bring Wendy’s to join the Fair Food Program, even after three years of escalation in the Wendy’s fight: thousands of students taking action alongside farmworkers, student-led Boot the Braids campaigns on campuses throughout the country and a burgeoning national student boycott. And on March 3, hundreds of farmworkers from Immokalee and allies will march on Peltz's glitzy Trian offices in NYC to kick start the CIW’s Workers' Voice Tour! With the tour just weeks away, let’s remind Peltz that the demand for justice will not stop until Wendy’s joins the Fair Food Program. Take action with hundreds of students, people of faith and community members on Jan. 27 for a national call-in day to put the pressure squarely on Peltz to push Wendy’s to sign a Fair Food Agreement with the CIW. Below are the details and script – and let us know how it goes by submitting a report back to organize@sfalliance.org. Script: Hi, my name is __________ and I would like to leave a message for Nelson Peltz. As an ally of the Coalition of Immokalee Workers, I want to remind Mr. Peltz that it is time to take responsibility for farmworkers’ human rights in Wendy’s supply chain, and bring them to join the Fair Food Program. 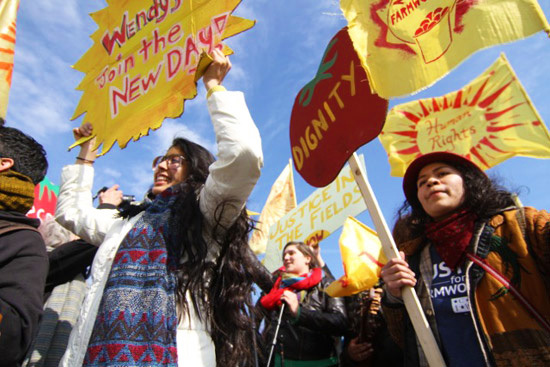 The CIW’s Fair Food Program is ensuring never-before-seen rights for farmworkers in Florida’s tomato fields and beyond, and, students nationwide are boycotting Wendy’s due to their refusal to get with the Program! After a three-year long campaign, CIW will be embarking this March on the Workers’ Voice Tour to let Wendy’s know that they must respect workers’ voices – and the first stop will be a powerful march outside of your offices on March 3. Thank you for relaying this message. CALL TO ACTION: Break up with Wendy's during Valentine's Day Weekend, Feb. 12-14! Wendy’s wishful thinking Code of Conduct can’t hang with worker-designed Fair Food Program!